This rare and interesting surname is of medieval English origin, and is an occupational name for an indoor servant. The derivation of the name is from the Middle English "home", homestead, manor (from the Olde English pre 7th Century "ham", village, estate, manor, homestead), and the Middle English, Old French "page", young servant (from the Latin "paggio", apparently ultimately from the Greek "padion", a diminutive of "pais", boy, child); hence, "young servant of the manor". Job-descriptive surnames originally denoted the actual occupation of the namebearer, and later became hereditary. The surname is most widespread today in the Welsh border counties and in the modern idiom can be found as Humpage, Hompage, Humpatch, Humbatch, Hompatch and Hambatch. Recordings of the surname from English Church Registers include: the marriage of Humffrey Humpage and Mary Turner, which took place on December 18th 1614, at St. Julian's, Shrewsbury, Shropshire; the marriage of Mary Humpage and William Williames, which took place at St. Chad's, Shrewsbury, Shropshire, on January 28th 1632; and the christening of Thomas, son of James and Jane Humpage, which took place at St. Andrew's, Holborn, London, on March 5th 1636. 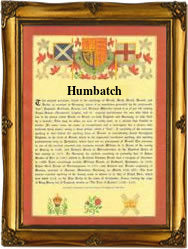 The first recorded spelling of the family name is shown to be that of John Humpatch, which was dated February 7th 1609, marriage to Elyzabeth Whetley, at St. Edmund's, Dudley, Worcestershire, during the reign of King James 1 of England and V1 of Scotland, 1603 - 1625. Surnames became necessary when governments introduced personal taxation. In England this was known as Poll Tax. Throughout the centuries, surnames in every country have continued to "develop" often leading to astonishing variants of the original spelling.